All right, it’s official – I need to get some damn patience. 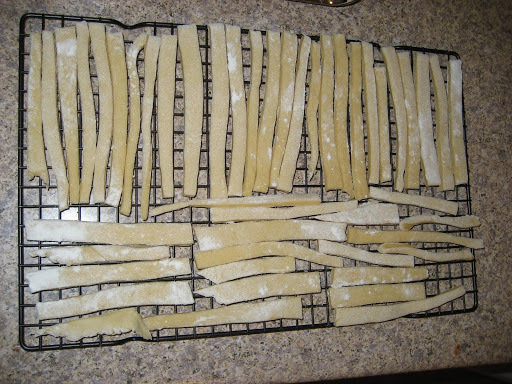 These are the egg noodles I made today to go into my chicken noodle soup. And this is my chicken noodle soup. Notice how there are noodles in there that don’t quite match the size and shape of those above? Yeah, that’s because I didn’t make them in time to let them dry. And when I tried to add them because I was getting hungry – you guessed it – they fell apart. So, I removed the few noodles I put in, threw in some Udon noodles, and voilà, mediocre chicken noodle soup. I know what you’re thinking. 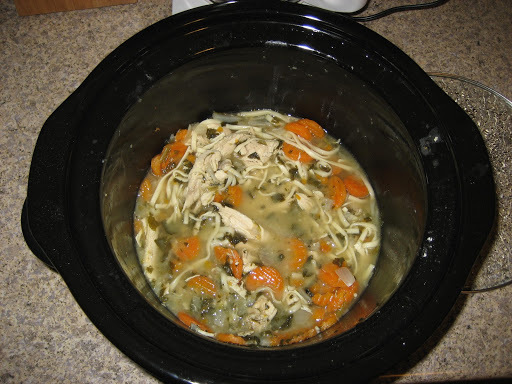 “Hey, that looks like it’s cooking in a Crock Pot, why didn’t you start the noodles right away if that soup has been cooking all day?” You’re right, that would have been plenty of time. But I got carried away doing other things and didn’t start the stupid things until 4:00 pm. So, when I got impatient around 5:30 pm and thought they’d be dry enough to add, I threw them in. Now, I know getting this flustered over soup is kind of ridiculous, but there’s something so disheartening about screwing up something you know how to do well. You know when you’re a little kid in the spelling bee and you get really excited because you know how to spell your word, and you can barely hold it in long enough for your teacher to finish, but when the letters come rushing out they’re all mixed up? It sort of feels like that. Changing the subject Moving along to end on a more positive note, Darrell and I went to the Festival of Lights at the Cincinnati Zoo last weekend. It was cold, packed and an absolute madhouse, but also kind of awesome. 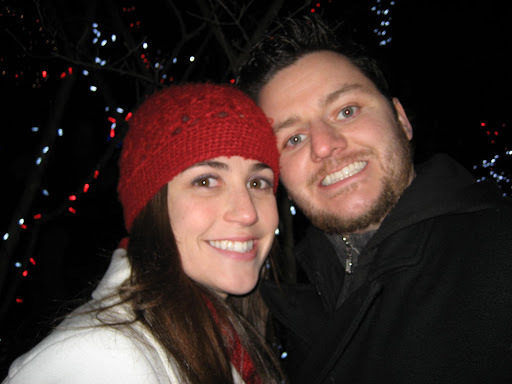 Neither of us had ever been, even though I grew up in the Tri-State, so it was a fun way to kick off the holiday season for the two of us. Don’t judge me. I didn’t ask anyone to take the picture for us, at least. And besides, he pretended the soup was delicious, so he deserves a picture post.